One of most fiddly parts of this job is getting the old tap off which is held in place with a large back nut. This can be quite inaccessible. You may not be able to get an adjustable spanner in place or a 7inch footprint wrench so you may need to use a special tool to get this off. 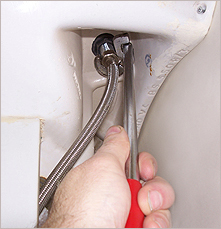 An adjustable basin wrench should cover most sizes. They can also be a bit seized up so its worth spraying them with WD40 which will help to release the nut. Bath taps can be very tricky indeed. For a beginner you may be more advised to get a plumber in. Sometimes with kitchen sinks I have on occasion found it easier to remove the sink to get better access to the tap!! Mixer taps generally have a slightly different means of fixing. they use a metal collar and rubber washer held in place with a threaded shaft and nut(one or two depending on the brand) You'll need a small spanner to loosen/tighten this. Sometimes they also have a slot in the end of the nut which you can tighten with a long screwdriver. This can be quite tricky if you are in an awkward position. If you can't get a normal spanner on the nut try a box spanner. If you are replacing a tap with an exact match this will may the job easier as you won't have to worry about modifying the pipe work. 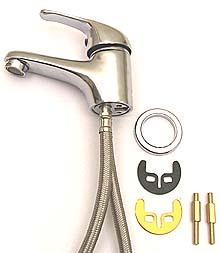 Firstly unscrew the the nut holding the water pipe to the tap. Next unscrew the back nut holding the tap to the sink/basin. You should then be able to pull the old tap out. Attach the new tap making sure its nice and tight. They should come with anti slip washers, or alternatively you could bed them in with a dab of silicon. 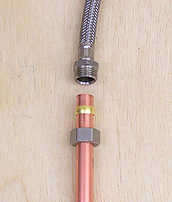 Mixer taps with have solid copper pipe or flexible pipe tails approx. 12inches long. With a footprint wrench unscrew these from the water pipe. Next unscrew the retaining nut which tightens against the metal holding collar. The tap should then pull out. When putting on the new tap fit the pipe tails to the tap first before attaching it to the sink. Its very difficult to tighten these with the tap in situ. 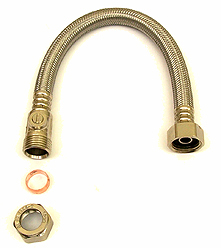 If the pipe work to your old taps had flexible hose then fitting a new tap should be fairly straightforward. 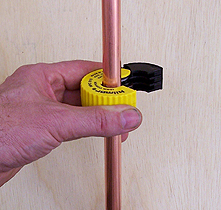 If you have solid copper pipes then unless your new taps are the same length it's going to be a bit more fiddly. 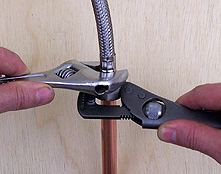 If it's a different tap you may find that the part where it connects to the pipe work is a little longer or shorter than the existing tap. This means you can't simply screw it back if your pipe work is solid copper pipe work. An easy way to deal with this is use flexible hosing. 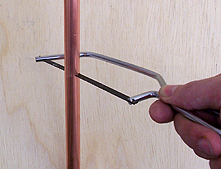 You need to shorten the copper pipe by at least six inches for the flexible pipe to fit in. 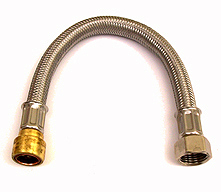 This makes the job quite easy as you can attach the flexible hose to the tap before fitting the tap. 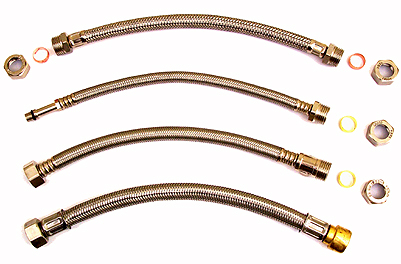 Finally connect the flexible hose to the pipe work. An alternative is to buy a special pipe cutter. These are great. You simply clamp the cutter round the pipe and turn it until the pipe separates. It's really easy to use and you end up with a perfect cut with no sharp burrs as you do with a hacksaw so it's ready for your compression fitting. They are also very compact so can be used in very confined spaces like under a sink. To fit the hose to the pipe work firstly make sure the pipe has no sharp edges. File or sand off any burrs then clean up the end with some wire wool. The flexible pipe fitting come with push on fittings or compression joints. The push fit type simply pushes onto the pipe. (make sure you push it firmly into place as far as it will go). The compression fitting require a couple of spanners, or a spanner and footprint wrench. Put the nut of the compression joint onto the end of the pipe, then push the "olive" ring onto the end of the pipe. Next push the body of the hose on to the pipe and screw it up with the nut. Use spanners or mole grips and wrench to tighten up the nut. As you tighten it up the brass "olive" is compressed and creates a water tight seal. Make sure you get the nuts nice and tight. These are even easier to use though are generally a little more expensive. Make sure the pipe has no sharp edges. These work best when you've used the special pipe cutting tool shown above rather than a hack saw. Make sure the pipe is fully pushed into the fitting or it will leak. Also, the end will be different depending on if it's for a mixer or normal tap. And, you can choose between push fit or compression fitting.